During the American Revolution, Revere acted as a messenger for the battles of Lexington and Concord. On the evening of April 18, 1775, Revere left his house in the North End and traveled to the Old North Church, beginning his famous “midnight ride.” After informing patriots at the church of the movements of the British army, he rode to Lexington with William Dawes to warn Samuel Adams and John Hancock, who were wanted by the British army. After the war, Revere opened a hardware and home goods store and then an iron and brass foundry in the North End. Though he lived in other homes in Boston, Revere spent most of his adult life in this North End home with his family. The two upstairs rooms of the Paul Revere House contain furniture believed to have belonged to the Revere family. In addition, 90% of the building’s structure is original. 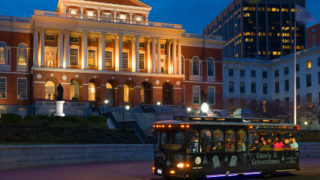 Old Town Trolley is a convenient way to explore the Paul Revere House while maximizing your vacation time. The oldest house in downtown Boston, this 3-story building was the home of silversmith and Boston Patriot Paul Revere. Today it stands as one of the first historic homes to be be converted to a museum open to the public. Find the lowest price and money-saving packages by purchasing tickets direct through our website.